Hello all! Aren’t you so glad it’s Friday?! This week has gone by really fast, which is a GREAT thing. I always look forward to Fridays b/c our weekends are often filled w/ fun adventures. Tomorrow, we are taking Zoey to a pumpkin patch and I can’t wait! Anyhow, this post idea came to me after I was tagged by a reader to answer some questions about what inspires me, what’s the toughest obstacle I’ve been through, etc. Instead of getting all deep and mushy, I decided to just share a few fun facts about me. Just something lighthearted for Friday! Enjoy. 1. I DON’T own ANY credit cards. I haven’t bought anything on credit in eons. Don’t get me wrong, I used to own a few a very long time ago but they got me in more trouble than not. A few yrs back, I decided to make an executive decision to sever them from my life. I have always been poor w/ money management, this way I can’t spend what I don’t have (kinda like deleting his number from your phone so you can’t call him but ended up memorizing his number anyways, sigh…)! In conclusion, not having credit cards is probably the BEST money management decision I’ve made. 2. I prefer to shop SOLO. I don’t care to have shopping buddies. To me shopping time is me time. It’s a time for me to reflect, have freedom, and just be. I don’t want people to wait on me and vice versa. And I dislike being rushed, unnecessarily. If it takes me 30 mins. to decide on a dress, so be it! Sometimes, I do a hit and run, in and out! Whatever it is, I make the decision. 3. I CAN’T stand SLURPING! For me, it’s not about being rude (I don’t get offended), it’s more about being annoying! When you have 4 people slurping at dinner simultaneously, it’s like attending a slurping musical. This bothered me most when I was pregnant (I was VERY sensitive). Seriously, can a girl eat in PEACE?! Look, I don’t hate you (never said I hate slurpers) but just be more aware next time you do it. I don’t doubt that yo mama’s homemade soup’s ‘da bomb’ but most of the time, just turning down the slurping volume will suffice. 4. I HATE receiving mail. Here’s my daily mail routine. Sometimes, I don’t even check mail (the hubs grab them when he gets home) but when I do, I just stack them in a pile. After a week or two, the hubs usually goes through them and discard what’s unnecessary. If it’s something important for me, I leave it to side. Most of the time, unopened. I mean, what’s so important that I have to read?! 5. I am a PERFECTIONIST at work. My former colleagues can def. attest. I am a problem solver. If there’s an issue, I’ll find a solution. I NEVER delete ANY work emails unless absolutely necessary. My work inbox used to be over quota all the time. As much as I am a crafty creative, I am a believer in numbers, analytics, spreadsheets, etc. If you want to know when I exchanged an email with a vendor about a product, I’ll come back w/ the email plus the product description, price, time, date of email. You don’t have to ask me twice. When it comes to work, I don’t play. 6. I am a lip balm ADDICT. I can’t stand dry lips or seeing dry cracked lips on others (please keep your lips moisturized). Each morning I use lip balm after washing my face/brushing my teeth. I lip balm (yes, it’s a verb now) throughout the day for continuous lip moisture. At night after brushing my teeth/washing my face, I lip balm before hitting the sack. Rosebud is my FAV! I LOVE the cute tiny tins, they remind me of old glam. I probably have one of each flavor. 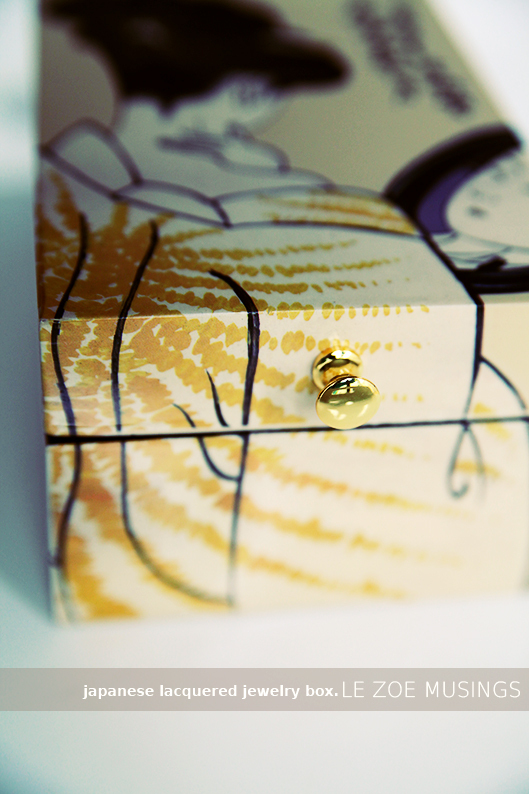 Currently, they live in my little Japanese box. 7. I sleep w/ my hair up in a ponytail. This is bad beauty habit, I know! I can’t stand hair all up on my face when I sleep. Can a girl breathe?! 8. I DON’T handle paying bills. Truth is, I have no clue how much any of our utility, cell phone, or car insurance bills are. My husband handles all this. I know, a lot of you women are probably cringing… man makes money, woman handles money… NOT FOR ME! Please recall to #1 that I am a POOR money manager. My hubs is BEST at handling money in our unique situation. He’s very meticulous and knows where each penny is spent. I am quite the opposite. And if you say don’t trust the man w/ your money…look, I’ve been w/ him for over 12 yrs. I TRUST HIM! And if I didn’t, we have a problem. 9. Don’t elbow me when I eat! When we eat dinner, I need my space from the hubs. Don’t sit too close, give me some reasonable distance. Elbow to elbow? NO thanks. I don’t want your chopsticks touching my chopsticks. Girl gotta eat! 10. Budget? What budget? When my cousin asked me if I had a monthly shopping budget for Zoey’s clothes. I was kinda surprised. Never occurred to me. I mean, I don’t have one but I make very smart buying decisions. The sturdy leather Gucci tote doubles as a diaper bag. The coated canvas Valentino bag works great for rainy and snowy days. And my Ferragamo rain boots? Both stylish AND functional. And yes, Zoey has 3x’s more clothes than I do. YEP. 11. I like cafeteria foods. One of my most favorite foods is Natchitoches. These Louisiana meat pies were served in my middle school cafeteria. So freakin’ yummy! I think about these meat pies all the times and actually learned how to make them. I just can’t get them out of my mind. 12. I speak, read, and write Vietnamese (Clue: I am Vietnamese). And so does my husband. I speak mainly Vietnamese to Zoey and my husband speaks mainly English to her. It appears as if she understands the both of us! We would love for her to learn a third language, preferably Chinese or Spanish. Both very popular and useful in this day and age. Please share something about yourself! I would LOVE to hear all about it! I like shopping alone too! MMMmm cafeteria food!! Or do we just love the taste of nostalgia?! Oh and I love shopping alone too! I wear my hair in two long braids when I go to bed. Gives a nice wave in the morning. Slurping doesn’t bother me, but I think it’s poor home training when someone does it. My husband makes more money than I do, but I need to know where we are financially so I keep a running total at all times. I am neurotic like that! I run on what my sister and I call “Melba time” because it usually means running a “little” late. I am a slob. I love to craft. I like your honesty and elegant! I, myself, don’t own any credit cards due to horrible experiences in the past. And I, also, prefer to shop alone. Have you ever been in those awkward situations, though, where someone says “Oh, you’re going to the mall? Can I tag along with you?”. I feel bad saying “no”, so my “me time” gets thrown out the window because of social convention. BUMMER! I’ve been eyeballing the rosebud balm at Sephora for a very long time now, and I think this post just got me into buying it! The tins are adorable! The shopping solo really resonated with me. I just don’t see it as a group activity. Occasionally I like to browse with a friend or one of my daughters, but the rest of the time I’m focused on finding what I want and in and out quite quickly! More blogging time that way! Love these fun facts! 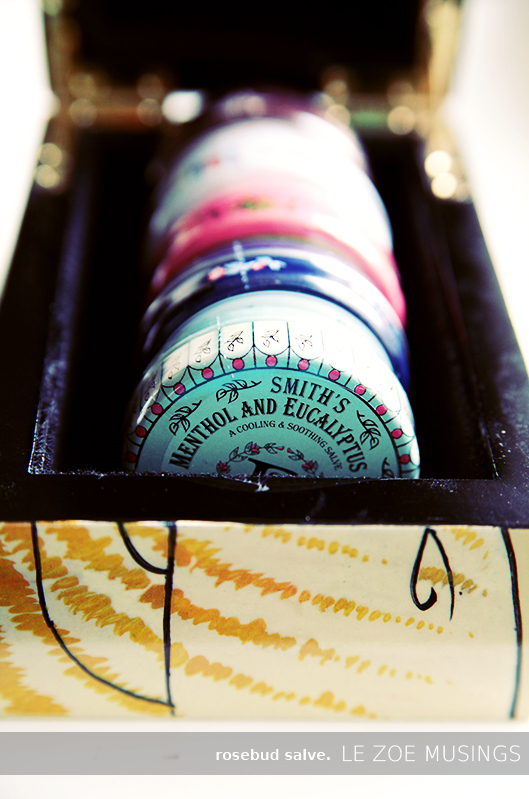 I adore lip balms too, have you tried the pangea organics lip balm? the lavender cardamom one is my new favorite! I love that you don’t have a credit card. I see them as a experiment that turned out not to serve us well. Debit cards are the answer should there be a question. Bravo! I’m on the path to becoming a cash only girl myself. 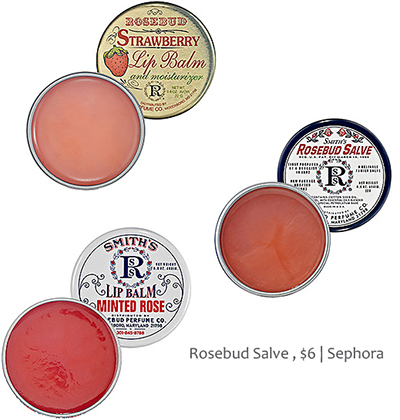 I love rosebud salve! Such an amazing beauty product! Omg, I am a lip product fiend! 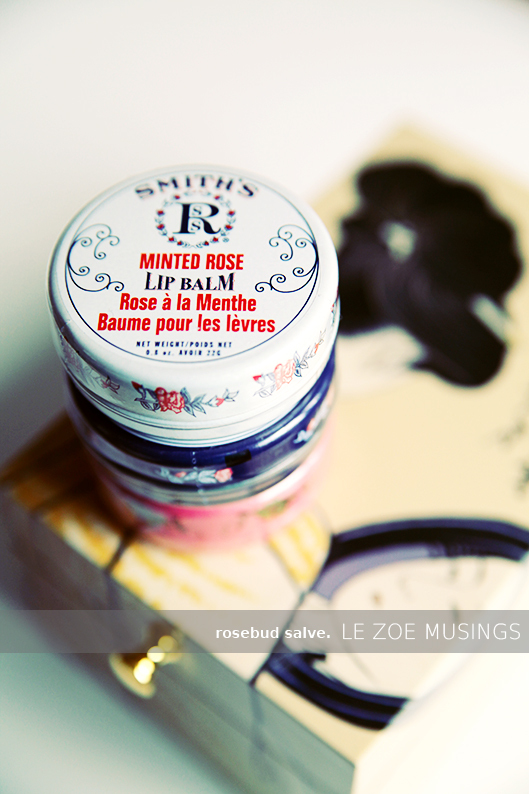 Rosebud lip salve? Oooh yeah. That is a before bed must for me. Have you tried Sara Happ’s Lip Slip and lip scrub? DIVINE if you are into hydrated lips. I am addicted to wipes. Seriously, I carry more varieties of wipes than any mom. Boogie wipes? Check. L.A. Fresh antibacterial hand wipes? Check. Wireless Wipes? Check. Mustela baby wipes? Check. Also, I always carry hand cream. Aveda Lip Saver has been my go-to chapstick for eons. However, those Rosebud tins are so cute I may have to switch things up! Dirty dishes on the counter kill me! Seriously?? Put it in the dishwasher already! We are Spanish, we (my husband, my 15 month old daughter and me) are living in London, my daughter doesn’t have budgets (she is all) and I sleep with a ponytail! and yes, I can’t stand slurping! I can’t shop with other people as well. I feel like I am missing the genetic code that women have for group shopping trips. If you’re in my way and taking me to stores I don’t want to go to, I am bound to get stir crazy. So ITA!!!! I also agree with you on point 2, 3 and 6! Especially 6! 🙂 I love the honey lip balm from Nuxe. It moisturizes so well! I’m also so perfectionistic in work..and everything else haha. love this post! I am the same with you when it comes to credit cards. Had 2 when I was in college and got rid of them! Too dangerous! 1) I’m half Vietnamese! I can’t speak it or write it, but I do know the food. My favorite is: banh xeo. Haha. Yum! (Spelling?) do you know how to make that? 3) first concert I went to was The Spice Girls! Love these! Fun fact I remembered when you mentioned your pumpkin-patch plans: when I was a kid my parents would take me to “Remingler Farms” in the fall, where they had all sorts of pumpkins and scarecrows, a hay maze for kids to run through, puppet shows, and rides. Not to mention yummy (sticky…) caramel apples and fall treats. Having seasonal traditions is one of the funnest parts of childhood! I know one word in Vietnamese (that I remember from my visits there). The word Hua. A little girl taught it to me and I love remembering her teaching me it. I saw her on my next trip and said Hua and pointed to a flower. She was pretty excited! Wow! Thanks for this post, this makes me think about things about me too! »I also prefer to shop solo. Something about myself… I recently started a diet in which I can only have 70% or more cocoa chocolate. After, enjoying milk chocolate for 27 years I have now officially converted, both Purdy’s and Lindt have excellent 70% Cocoa dark chocolate and it is the best my favorite, so much flavor! PS the chocolate is not the diet just one of the rules in the diet. Credit card decition: brilliant move! Getting the mail: hassle. And then it piles up and piles up . . . yuck.